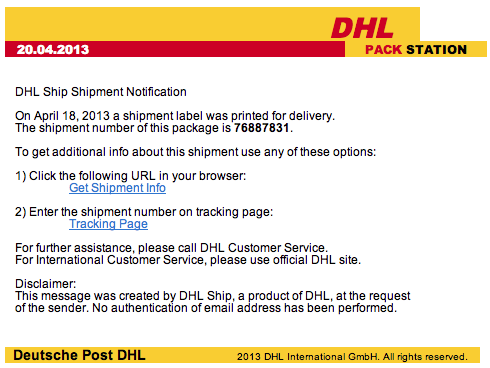 Received this phishing scam email this morning disguised as being delivered from DHL. As always, do not click any links in suspicious emails. Here is the actual text from the email. On April 18, 2013 a shipment label was printed for delivery. The shipment number of this package is 76887831. For further assistance, please call DHL Customer Service. For International Customer Service, please use official DHL site. This message was created by DHL Ship, a product of DHL, at the request of the sender. No authentication of email address has been performed.